Hey everyone 🙂 I wanted to share this real quick. The idea has been in my head for a few weeks now and I finally got around to doing it! Now I get to share it with you too. For this, you will need a long sleeve shirt. I used a knit one. I’m not sure how well it will work with a non-knit one, but you could make it work I’m sure. 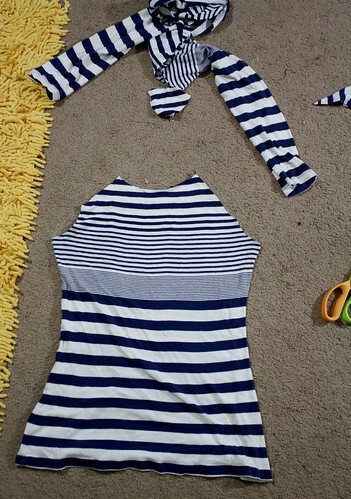 Go grab some scissors and pins and let’s transform the wintry shirt into one ready for summer! PS… also remember to use the right needle for knits, etc. It will make your experience so much more pleasant! 1. 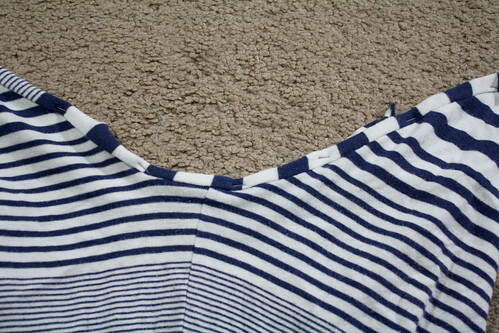 Lay your shirt flat on the floor. 2. Take the scissors to it and cut out a shape like this. I did one side first, then folded it in half and copied the cut. 3. 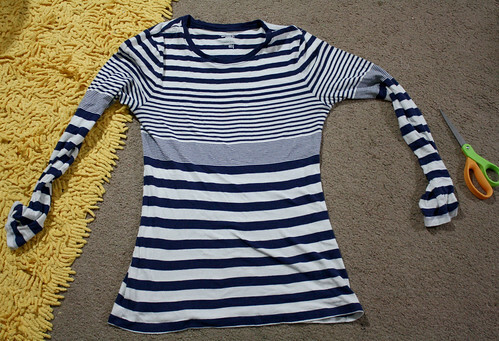 Cut two long pieces from the sleeves. Make sure they are a decent width (at least 1.5″). 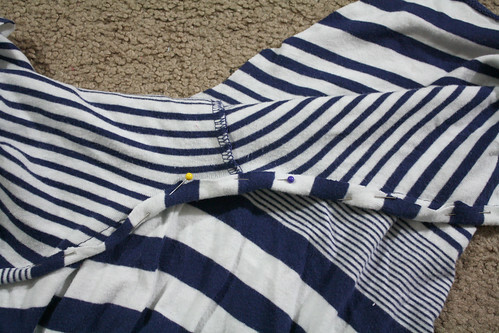 For length, I just cut a strip from the longest part of the sleeve. 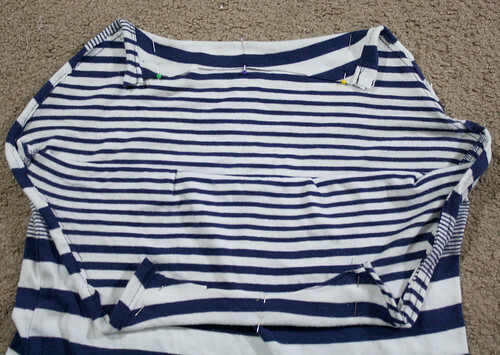 If you need it to be longer for the next step, you can always cut more strips and just sew them together. 4. 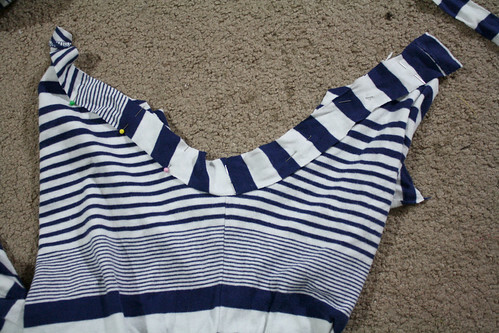 Take one long piece and pin it around one side of the shirt, right sides facing. Sew in place with at least 1/4″ seam allowance. I think I did a 1/2″. 5. Fold the piece up and over and pin in place. 6. Sew it in place. 7. Fold the top front and back down some to create a casing. The amount is up to you. Pin in place and sew across bottom of fold. 8. 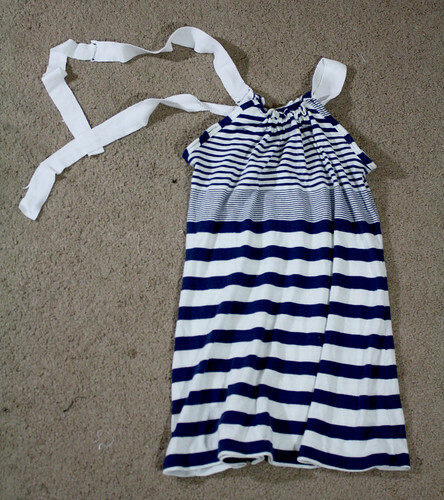 Use long pieces from the sleeves to create a piece to tie through the casing. Or you could use pieces from another shirt, ribbon, rope, etc. Make it as long as you like. I originally was going to have it long like this so I could do a bow and have the ends hanging, but I didn’t like that. So I just ran the piece through the casings, sewed the ends together, and hid the sewed part inside the casing. Have fun and make it yours! It’s very cute, what a great idea. I can’t wait for summer to arrive. Actually, I’d be happy for spring to finally arrive where I live. Super easy to do… amazing! I think I will try it myself once I find the perfect t-shirt! You are so clever to refashion stuff. And you make it look so easy! One of these days I will have a go at refashioning. It will be using your tutes! While I am flowing with the compliments… 🙂 I would also like to add that I really like the way you do your hair. Very pretty. I love this. I have a Gap t-shirt that had a stain on the back of one of the sleeves. I’ve been trying to figure out what to do with it and you just gave me the perfect solution. Now only if I can get it to work out as easy as you. My sewing skills are so bad. But I’m going to try it. Thanks for sharing it. This turned out so cute! Thanks for the great tute! You are so so clever! And your tutorials are always so detailed and user friendly! 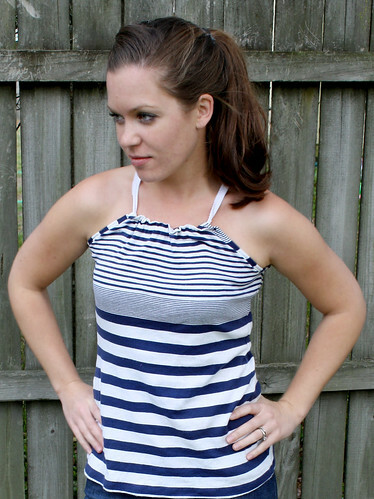 I had this same shirt but made a yoga-waist skirt for my daughter! Both refashions with this shirt look AWESOME!